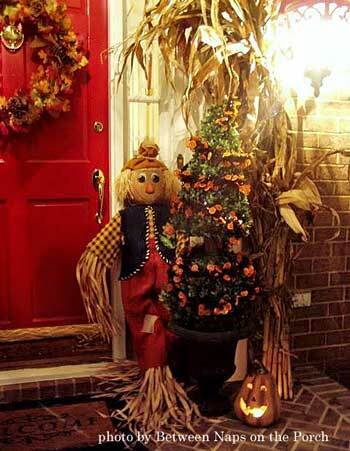 Thanksgiving decoration ideas are as abundant as the many blessings that we have in our lives. Dave and I love Thanksgiving. It's simply about giving thanks and enjoying time together. I have to admit I love all the delicious food and pumpkin pie, too. As you decorate for Thanksgiving, begin with your front porch. What better way to say "welcome" than with beautiful outdoor Thanksgiving decorations. Your family and guests will appreciate the splendor of the season. Dave and I love the simplicity of Thanksgiving. Do you as well? 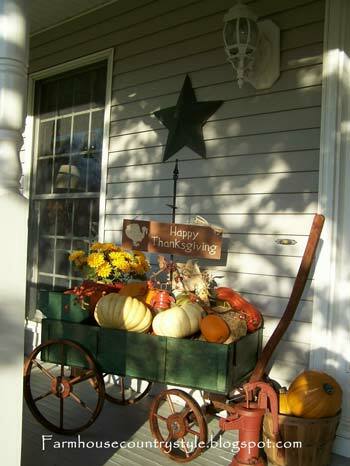 It's so very easy to decorate your porch for Thanksgiving as you see here - just a beautiful extension of autumn. With thanks to Renee Kubiak who shared her lovely autumn porchn(below) with us. 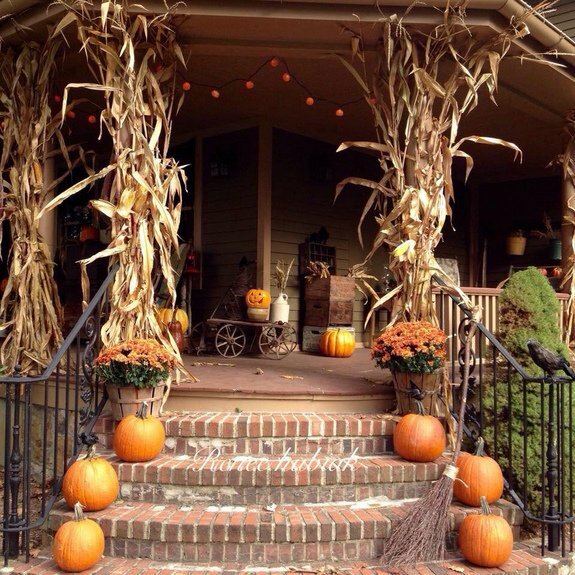 With cornstalks, mums in bushel baskets, pumpkins lining the steps and vintage items so beautifully displayed, Renee has created such a welcoming porch. It's beautifully decorated for autumn and Thanksgiving. 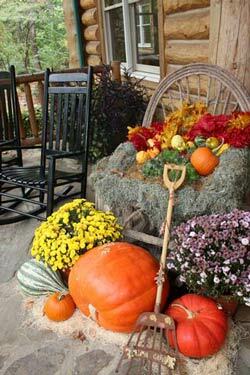 Combine traditional autumn decorations like the faux painted pumpkins, colorful fall leaves, and a little burlap to create a most pleasing outdoor Thanksgiving arrangement. Mother Nature seems to do some of her best work in the autumn with all the brilliant shades of color like red, orange, gold, amber and brown. 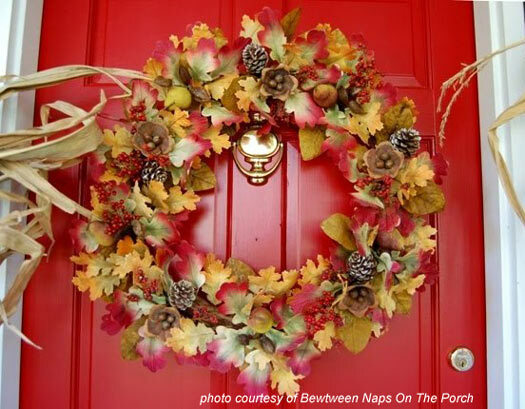 Hang a wreath on your front door that is adorned with festive holiday ribbon, berries or even colorful flowers. 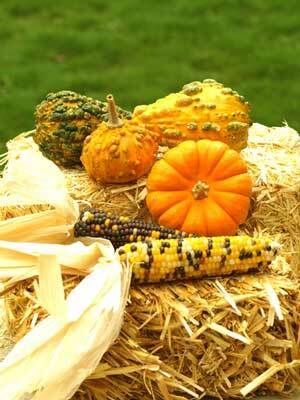 Attach corn stalks to light posts, columns or pillars and arrange pumpkins and gourds around the base. See Shelly's pretty harvest home. 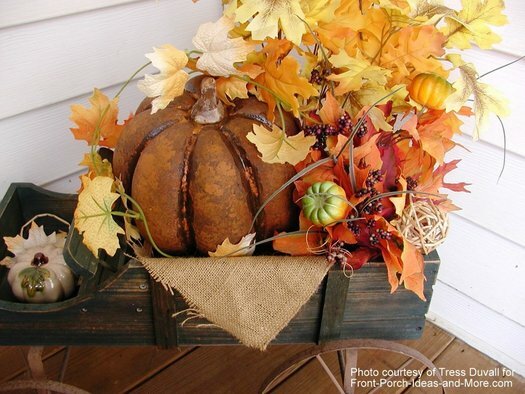 Enjoy how Kristen brings autumn to her porch. Use potted plants such as mums in a variety of colors and sizes to add splashes of color to your porch. Get several different kinds for contrast and place them along the steps or walkway leading up to your front porch. Window boxes are also a great Thanksgiving decorating idea - like the picture shown here. You can plant flowers and then accent them a garland of fall colored leaves or berry covered vines for that harvest feel. Thanksgiving decoration ideas need not be too elaborate. You can create a warm, welcoming, homey feeling that will be felt by all by using just a few Thanksgiving decorations for your porch. It does not matter if your porch is large or small, you will be able to make it a warm, friendly entrance to your home. Decorate pumpkins with a beautiful glaze like Kate did. Take several ears of Indian corn and use some wire to twist it together to create a cluster. Finish it off by tying some natural colored raffia around it to make a bow. Now you have a stunning three dimensional work of art that can be used as a door hanging or even attached to some corn stalks for depth and color. Use banners that are in the shape of pilgrims or turkey on your porch. Some banners have words like "Give Thanks" or "Happy Thanksgiving" on them. 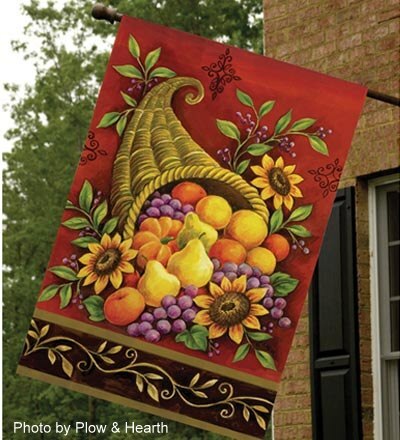 Thanksgiving Flags can be hung from your porch or even attached to a Shepherd's hook in your yard. Our friend, Susan, who is the author of the popular blog Between Naps on the Porch, has a wonderful talent for decorating and making her house a home. She is graciously sharing with us photos of her autumn decorated porch. Charming autumn and Thanksgiving decoration ideas! I really love this fabulous autumn wreath against Susan's deep rich red front door. Wow, just that alone is a real warm welcome! A bounty of beautiful pumpkins, leaves and stalks. A very beautiful way to say: "Welcome, friends and family." "Happy Autumn!" "Happy Thanksgiving!" 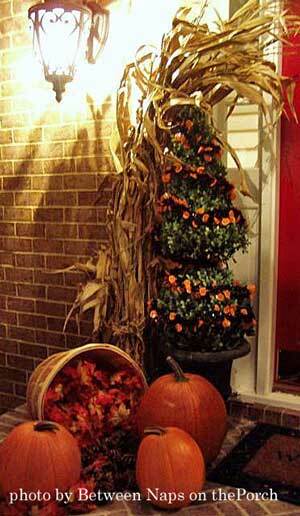 This makes a lovely entrance and is a very appealing way to greet your family and friends at Thanksgiving. It sets the tone for the day and lets your guests know they are welcome. Thanks, Susan! Please visit Susan's blog, Between Naps on the Porch, for lots of wonderful interactive posts about before and after decorating, tablescapes and more of Susan's secrets. As you can see, there are so many Thanksgiving decoration ideas, so the hard part is deciding which ones you want to use as you give thanks during this holiday season. 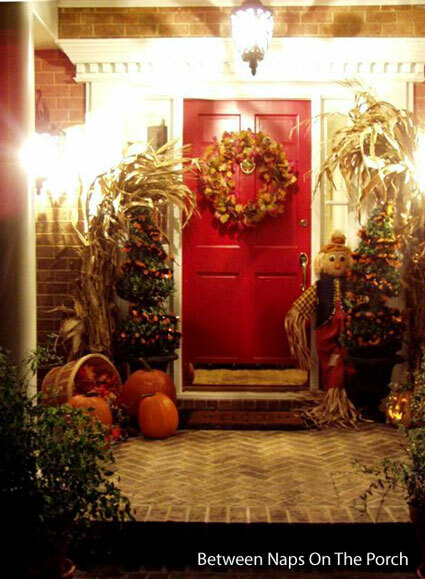 As you decorate for Thanksgiving, you will be surprised at the ideas you will have for decorating your front porch. 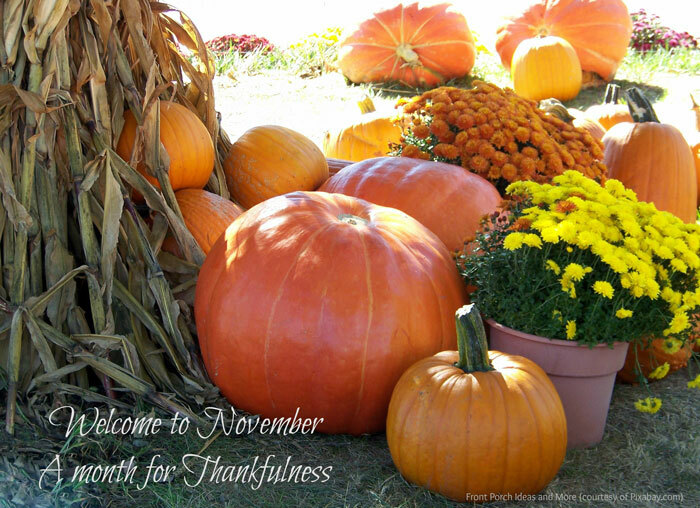 Please join us in being very thankful for our many blessings. One of our readers shared a pictures of his porch that he titled: Thanksgiving Decorations Dusted by Snow. He lives in Colorado and has an awesome porch. See his holiday porch and others that readers have shared with us. 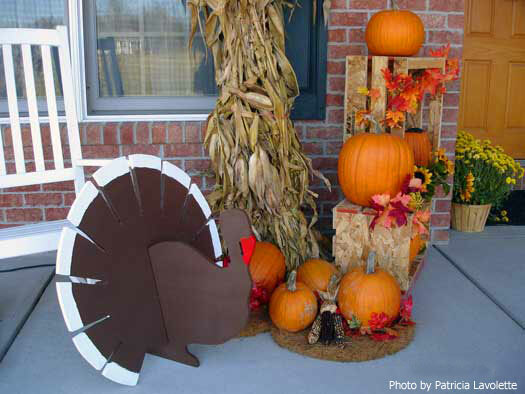 We have step by step instructions for you to create a similar garland for your Thanksgiving porch.